On Monday evening, my roommate and I got to be apart of a really cool event that reminded why I love movies so much. Along with hundreds of people across the country, we were treated to an IMAX screening of an extended teaser trailer for Batman v Superman: Dawn of Justice. We got to the cinema about an hour before the event started, and there was already a decent line. After about half an hour of waiting, a Warner Bros. representative started letting us into the theater. At the door, the representative took our tickets and gave us both passes to see the movie a week earlier than when it comes out next year. That was probably one of the coolest parts of the night So now you know where you’ll be able to find an early review next year! Review coming a week early!…in 2016. Before the event started, the Warner Bros. representative read a letter from Zack Snyder thanking everyone for attending the screening and for not watching the bootleg teaser that leaked last week. We then saw a video message from Snyder before the extended teaser played. The extra footage was only five seconds long, but it was made clear that this extra footage would not be attached to any other print of the teaser. Snyder came on the screen a second time once it ended to point out the scenes that were shot in IMAX. The teaser played once more, and now that I knew what to look for, I realized that the scenes filmed in IMAX looked incredible. 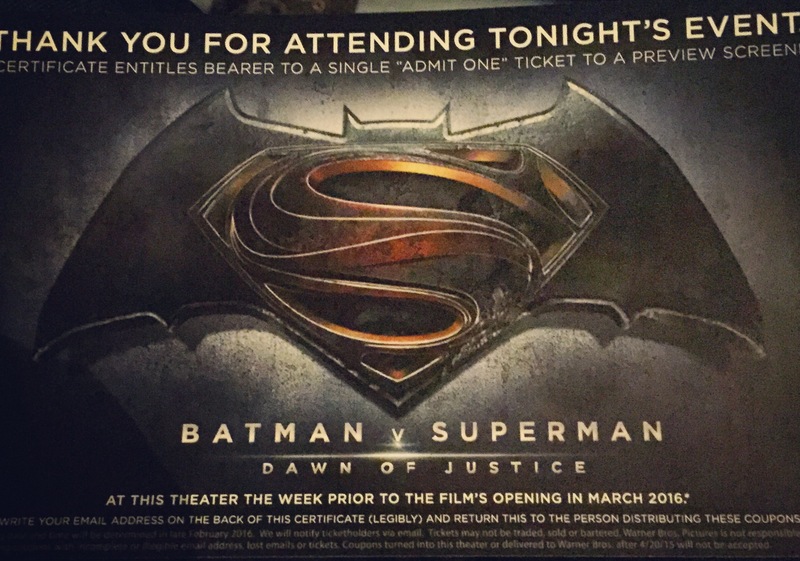 As we left the theater, we received exclusive character posters for both Batman and Superman. Overall, it was a great night and a great success marketing-wise. For a description of the extra five seconds of footage, check out the mild spoiler below.